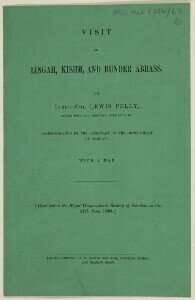 In early 1864, the Royal Geographical Society in London held two discussions on the interior of Arabia, which resulted in a series of questions on the topic being sent to Lewis Pelly, Political Resident A senior ranking political representative (equivalent to a Consul General) from the diplomatic corps of the Government of India or one of its subordinate provincial governments, in charge of a Political Residency. in the Persian Gulf Historically used by the British to refer to the sea area between the Arabian Peninsula and Iran. Often referred to as The Gulf or the Arabian Gulf. . Due to his experience in the region, he was seen as the person most likely to know the answers. 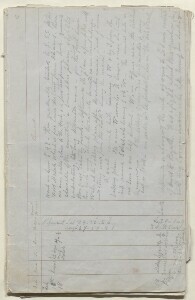 However, the Royal Geographical Society also made a number of assertions, which caught Pelly’s attention: that no Englishman could travel through Nejd (Najd, in present day Saudi Arabia) territory as he would be killed; and that no scientific and accurate records were available that could precisely establish the longitude and latitude of the capital of the Nejd, Riyadh. These assertions spurred Pelly on to action. After responding to the Royal Geographical Society’s questions, he wrote to Her Majesty’s government requesting permission to arrange an official visit to the emir of the Wahhabi tribe, who ruled the Nejd territory, from his capital at Riyadh. The trip would serve the twin purposes of acquiring information and intelligence about this little-known part of Arabia and restoring friendly relations between the Wahhabi tribe and the British Government. But it’s also clear that Pelly wished to prove that an Englishman could indeed travel unmolested and without fear of injury through the Nejd territory by being the first to do so. In December 1864, the British Government agreed to Pelly’s request and he began to prepare for this undertaking. Pelly’s first step was to solicit an invitation from emir Faysal bin Turki Al Sa’ud, the ruler of Nejd. Pelly drew little encouragement from the emir’s response to his first letter but reports from informants suggested that Faysal was warming to the idea. This emboldened Pelly and, without waiting for a reply to his second letter, he decided to attempt to undertake the visit without formal permission. In January 1865 he travelled to Kuwait to make the necessary arrangements for a trek through Nejd to Riyadh. Upon arrival in Kuwait, Pelly informed his hosts, the Sheikhs of Kuwait, of his intentions to travel to Riyadh. From Kuwait, he wrote a further letter to emir Faysal informing him that he was en route to the capital as he believed their ‘becoming personally acquainted would be mutually satisfactory’. He was obliged to wait in Kuwait until a response had been received from the emir. This, arrived on 7 February, and he departed for Riyadh on 18 February. Pelly used the intervening time, however, to acquire information about the geography and landscape of the interior that they would soon be travelling through, to arrange camels and a guide, as well as to learn more about life in Kuwait. He documented all of this in detail in his journals and reports. When they did finally depart, Pelly was accompanied on his trip by Dr William Henry Colvill, the Residency A diplomatic office of the British Government established in the provinces and regions considered part of, or under the influence of, British India. Surgeon at Bushire, who was tasked with collecting samples of the flora and fauna they encountered en route. These were sent to the Royal Botanical Gardens at Kew while geological samples were sent to Sir Roderick Murchison for examination. Lieutenant Edwin Dawes was also a member of the party; it was his responsibility to obtain astrological readings in order to establish longitude, latitude and elevation (altitude) of the various places they travelled through. The Residency A diplomatic office of the British Government established in the provinces and regions considered part of, or under the influence of, British India. interpreter, George Lucas, two ‘musselman’ servants, a Persian servant and a Portuguese cook made up the complement. The journey to Riyadh took sixteen days; all the while Pelly and his party meticulously recorded the geography and landscape, availability of water, distances travelled and details of people they met along the way. Scientific measurements and collecting were undertaken in secret so as not to arouse any suspicions. Once they arrived, Pelly spent four days in Riyadh, primarily in council with the emir Faysal, and his private secretary. A wide variety of issues were discussed, including the telegraph lines that were being laid throughout the Gulf region, the British anti-slavery policies, the extent of the Nejd territory and Britain’s rule in India. Unfortunately for Pelly his efforts to establish friendly relations with the Wahhabis were short-lived. Later that year the emir died, triggering infighting among his sons that eventually led to the fall of the Second Sa‘udi State. During this period of turmoil Faysal’s sons were unwilling or unable to continue the friendly relations Pelly had established with their father, which was a blow to Britain’s attempts to establish contact with the Sa‘udi rulers.